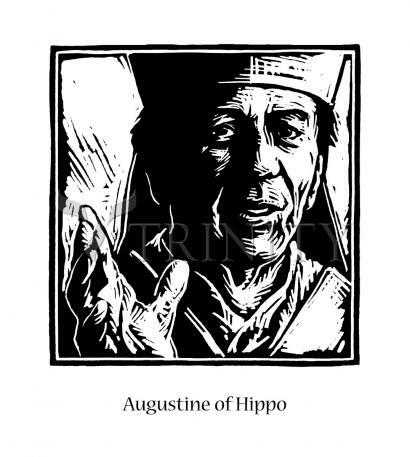 Augustine, who was bishop of Hippo in North Africa, is recognized as a father of the early church and one of the preeminent influences in the development of Western Christianity. He is revered by Roman Catholics and Anglicans, as well as in the Eastern Orthodox Church. He recorded his spiritual journey in his famous Confessions, a classic of both Christian theology and world literature. "Late have I loved you, O Beauty ever ancient, ever new, late have I loved you! You were within me, but I was outside, and it was there that I searched for you. In my unloveliness I plunged into the lovely things which you created. You were with me, but I was not with you. Created things kept me from you; yet if they had not been in you they would have not been at all. You called, you shouted, and you broke through my deafness. You flashed, you shone, and you dispelled my blindness. You breathed your fragrance on me; I drew in breath and now I pant for you. I have tasted you, now I hunger and thirst for more." His feast day is August 28. Augustine’s father was a pagan who converted on his death bed; his mother was Saint Monica, a devout Christian. Trained in Christianity, he lost his faith in youth and led a wild life. He lived with a Carthaginian woman from the age of 15 through 30. He fathered a son whom he named Adeotadus, which means the gift of God. Augustine taught rhetoric at Carthage and Milan. After investigating and experimenting with several philosophies, he became a Manichaean for several years which taught of a great struggle between good and evil, and featured a lax moral code. A summation of his thinking at the time comes from his Confessions: "God, give me chastity and continence - but not just now." Augustine finally broke with the Manichaeans and was converted by the prayers of his mother and the help of Saint Ambrose of Milan, who baptized him. On the death of his mother he returned to Africa, sold his property, gave the proceeds to the poor, and founded a monastery. He was a monk, a priest, a preacher and became Bishop of Hippo in 396. Augustine founded religious communities. He fought Manichaeism, Donatism, Pelagianism and other heresies. He oversaw his church and his see during the fall of the Roman Empire to the Vandals. He was a Doctor of the Church. His later thinking can also be summed up in a line from his writings: Our hearts were made for You, O Lord, and they are restless until they rest in you. The love of worldly possessions is a sort of bird line, which entangles the soul, and prevents it flying to God. God in his omnipotence could not give more, in His wisdom He knew not how to give more, in His riches He had not more to give, than the Eucharist.